Singer, songwriter, activist and even minister of culture, Gilberto Gil has occupied many roles in his illustrious career, but the focus on this set of albums is on the mid-1970s period and beyond when Gil acquired greater notoriety internationally and started to gain a foothold in both the American and European markets. Thankfully the trio of albums collectively known as ‘re’ are included here along with the 1979 ‘Realce’ (though strangely no ‘Nightingale from 1979 or even ‘Luar’ from 1981 that included one of his biggest UK hits, ‘Palco’). And a much later attempt at paying homage to the music of Bob Marley, ‘Kaya N’Gan Daya’ from 2002. Arguably Gilberto Gil has the broadest repertoire (stylistically at least, though Caetano Veloso would run him very close and Milton Nascimento has a diverse range of influences also) of any of the singers who emerged during the early-mid 1970s in Brazil and this has served him well in his career which had embraced myriad musical approaches from soul and funk through reggae and folk influences. A native of Salvador, Bahia, in northwest Brazil, Gilberto Gil began his career in the late 1960s, first as a songwriter, then as an artist and incorporated elements of samba and even bossa into the early songs. However, his rise to prominence came afterwards as an integral member of the tropicalia movement with other prominent figures including Caetano Veloso. Both sought refuge in London during the early 1970s when the military junta in Brazil was in power and repressive acts against political as well as artistic figures was a regular occurrence. He established himself with a series of early 1970s albums such as ‘Expresso 2222’ and a fine collaborative album with Jorge Ben, ‘Gil e Jorge’ before moving to Warner in 1975. This is where this box set begins. ‘Refazenda’ (1975) kicks off proceedings and was the first of the ‘Re’ albums. The significance of these albums collectively was both a semantic and a social one. They link in very much with the grass-roots movement of ‘Black Rio’ which black Brazilians closely identified with, especially because they had become tired of the slick MPB sounds which dominated the charts in Brazil. Black youths wanted to claim music of their own and which could tie in with the increasing black consciousness movement in the United States. Gil was astute enough to recognise this and his music at this stage catered to the needs and aspirations of that youth. He was also becoming increasingly aware of his own Bahian roots and of the need to illustrate these in his music. ‘Refazenda’ should therefore be viewed in this light and is one of his rootsiest albums of any throughout his distinguished career. From a linguistic viewpoint, it is also the first of the trio of albums that exploit the idea of artistic renewal and the very title of the album can be translated either as ‘Refarmulation’ (‘Fazenda’ means a farm or plantation and adding the prefix ‘re’ introduces the element of active renovation). From a musical perspective, then, Gil explored the historical choro genre on ‘Pai e Mãe’ (Father and mother) while a track such as ‘Logunedé’ (Lacemaker) clearly borrows from traditional folk song. It is important to stress that by 1975, Gil was now in his early thirties with several albums under his belt beginning back in 1967, and this is indeed the work of a mature musician seeking to explore new frontiers. The follow up album from 1977, ‘Refavela’, is above all a project of contemplative and spiritual endeavor with a new pan-African consciousness seeping through and is reflected in a growing interest in West African music that is reflected in the new album. Yoruba chants surface at times as do Ghanaian and Nigerian highlife and juju rhythms and Gil’s participation in the African Festac festival in Lagos in 1977 gave him a first foothold on the continent. The notion of Gil’s own African ancestry is the subject of ‘Babá Alpalá’. Elsewhere two compositions are devoted to the traditional carnival cortèges in Salvador that is part of the annual celebrations. The album culminates with ‘Afoxé’, which is in fact the name for an African-rooted procession linked to the cult of candomblé that is widely practiced in northwest Brazil. ‘Realce’ (1978) is where the wider international audience joins in and it was during 1978 that Gilberto Gil performed at the Montreux jazz festival. Continuing with the third manifestation of the ‘re’ series, the title track of the album emphasizes the importance of pure beauty and creativity. It was an important album also in that Gil’s first bona fide foray into reggae is registered with the song ‘Nao chore meis’, a Portuguese language version of Bob Marley’s ‘NO woman no cry’. A major international hit that has continued to enthrall the dance floors was found on the album and this is of course ‘Toda Mennia Baiana’. Among other highlights the brief samba-bossa song ‘Retento’ (Blossom) is a fine example of Gil incorporating classic elements of Brazilian folk into his selection while ‘Marina’ is a beautiful song written by Bahian wordsmith extraordinaire Dorival Caymmi (the Caymmi family being the Brazilian equivalent of the Watersons in stature). Fast-forward six years to the fourth album, ‘Raça humana’, from 1984, which is an example of Gil’s more commercial period and sits awkwardly with the rest of the music here. A better choice might have been the 1998 Brazil only release ‘Quinta gente veiro ver [Ao vivo]’, a live recording that brings together a well-balanced set of earlier songs and up to date material that includes the reggae idiom. What was a good idea. however, was to include the final offering, ‘Kaya N’Gan Daya’ from 200 which is devoted entirely to the repertoire of Bob Marley. For this particular recording Gil flew to Jamaica to record at the Tuff Gong studio where Bob cut his Island releases and while Gil’s own band (including the formidable bassist Arthur Maia) was retained, the presence of the I-Threes as backing vocalists adds some authenticity to the endeavour. Essentially, Gil’s approach to reggae is a tad lighter than that of Marley and therefore his interpretations work best on songs such as ‘Three little birds’ which he gives a lovely distinctive Brazilian flavour to with the use of non-reggae instrumentation and ‘Positive Vibration’, and somewhat less so on the protest material such as ‘Them belly full’ and ‘Rebel music’. Nevertheless those with a broad mind will appreciate the music for what it is and he certainly scored a hit in Brazil where there is a genuine love for reggae and Gil is by no means the only Brazilian singer to attempt the genre. 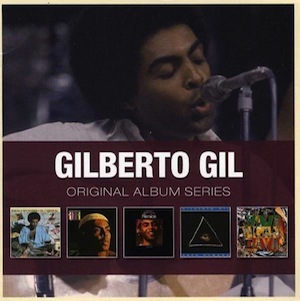 In sum a fine way to discover the music of Gilberto Gil.